This Christmas gift symmetry challenge is just that - a challenge! Use the grid to help you draw the missing half of the picture. If the kids can mirror this picture exactly through the line of symmetry, they will have a complete picture of a Christmas present! 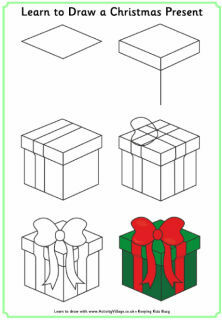 Use this fun finger tracing worksheet at Christmas or any time of the year to teach the children how to write the word "gift" and give them practice forming the letters correctly. Trace the letters in "gift" and colour in the picture. You could use this any time of the year but of course it is particularly useful in the Christmas classroom. Practice your poetry skills with the help of this acrostic poetry printable for the word GIFTS. It makes a useful writing frame, too. As well as poetry writing, we think our presents acrostic poem printable would also make a very handy page for writing a Christmas wish list or keeping track of what presents you are giving.